Seen passing the Cloch after her second visit to Greenock, AIDACARA was on her way to Oban as she continued on her cruise around the British Isles. She had arrived in somewhat dismal conditions earlier in the day from Dublin, having previously called at Dover, Le Havre, Falmouth and Cobh. From Oban, she would continue to Lerwick and Invergordon before returning to Hamburg, from where she had started. 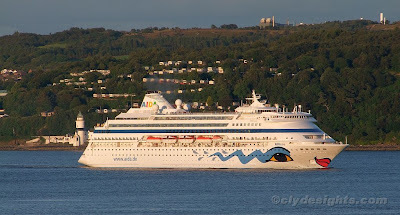 Completed in 1996, the 38,531 gross ton ship is 193.3 metres in length and is owned by AIDA Cruises, a subsidiary of Carnival Cruises that caters almost exclusively for the German cruise market. Absolutely stunning shot. Like that a lot.